Choose: Size King Queen Twin Full Cal King Twin XL Full XL Choose: Mattress Height 10" 14"
The Protect-A-Bed Basic Mattress Protector is an economical solution to mattress protection. The Unique Miracle Membrane® keeps the mattress free of spoils and stains. The fitted sheet style mattress cover is easy to remove, re-use, and is machine washable. The Protect-A-Bed Basic Mattress Protector Twin Size has many exciting features for users of all types. See the Protect-A-Bed Basic Mattress Protector Twin Size product video and gallery images above for more details. 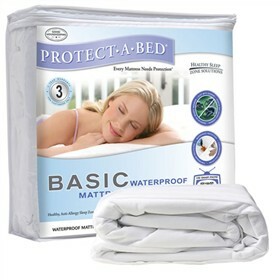 The Protect-A-Bed Basic Mattress Protector Twin Size is sold as a Brand New Unopened Item. I give this 4 stars only because it is soft, cool to sleep on and waterproof. I've owned 4 of them, they just don't last very long after a few washings. They start to degrade and have small tears in them that turn into rips/holes. I have an energy efficient washing machine and I wash them on gentle short cycle, I don't use any bleach and I dry them on low for a few minutes then take them out and hang to finish drying. Short life span so be prepared to buy more as time goes on.